Office Depot Toner cartridge. Compatible with HP CE410A. Suitable for LaserJet Pro 300 color M351a 300 color MFP M375nw 400 color M451dn 400 color M451dw 400 color M451nw 400 color MFP M475dn 400 color MFP M475dw. Page yield approx. 2.200 pages. Colour: black. Office Depot toner CE255X. For HP. Colour: black. 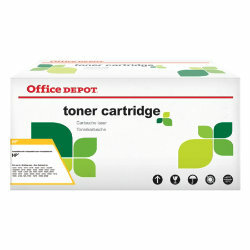 Office Depot toner cartridge CE252A. For up to 10.500 sheets maximum 5% coverage. Colour: yellow. Compatibility: HP Color Laserjet CM 3530 FS MFP CP 3520 Series CM 3530 MFP CP 3525 DN CP 3525 N CP 3525 X CP 3525. Office Depot toner cartridge CC364A. Page life: 10 000. Colour: black. Compatibility: HP Laserjet P4014 Laserjet P4014N Laserjet P4014DN Laserjet P4015 Laserjet P4015N Laserjet P4015DN Laserjet P4015X Laserjet P4515N Laserjet P4515TN Laserjet P4515X Laserjet P4515XM.